Ehrich, Tom - on the "musical conundrum"
A recent "Church Wellness" email from Tom Ehrich needs addressing. I've met Tom Ehrich, and heard him speak. I think he has some great ideas. But I found the content of this email troubling and its tenor disturbing. The title of the email: "Tips on resolving the musical conundrum"
Music itself -- or so it seems -- is a problem that needs solving. "I went [to church on] Sunday for one reason: a bluegrass group would be leading a sing-along before worship and 'country Baptist' songs throughout." He goes on to say that we need to be open to diversity in music, so why is this decidedly uniform musical display his example about church music? This isn't a "country Baptist" church I take it, so the exclusive use of this type of music in a liturgy must qualify as some kind of special event, or a stunt. And let's do address musical stunts for a minute. Let's say that this bluegrass group got Tom Ehrich really excited to go to church, which he says it did. What's going to get him excited about going to church next week? The same bluegrass group? Well, let's think about bluegrass like we do blue bleu cheese. It's delicious, but is it all I want to eat? No. And in fact, Tom is about to make this argument. We know that variety is the spice of life. So, what "stunt" does this church provide next week? Swiss? Pepper Jack? A fondue melting pot? "Line up 100 faithful Christians, and you'll hear 100 different stories about church music." I disagree. You'll hear at least 200 different stories about church music. Probably way more than that. And if these are faithful Christians standing in a line, it won't be long before they start to sing together, thereby generating additional stories. "Professional church musicians often consider themselves an embattled species, called to preserve classical hymnody and organ music and to resist all other forms." I'll take issue with this too, but only a little. It's called professional survival. If I go to school and study hard to be a chef, and then I am gainfully employed by a restaurant who, in an effort to be more diverse, wants to also provide sushi, I may resist making sushi or even have sushi introduced at the restaurant. "Look," I would say, "I spent my whole life studying this, and becoming really good at this. You hired me to do this, and now you want me to do something else that I'm not good at. One of the reasons that I enjoy my line of work is that I have literally tens of thousands of hours doing what I do. I have mastered my craft, and I am proud to offer this to my employer." "Not only that," I would continue, "But this is a great French restaurant because we have committed to being a really great French restaurant. What does sushi have to do with it? Can we really make sushi as well as the place down the street?" So, am I embattled? Well, a little perhaps, but not any more than anyone else who is having to change horses in midstream while having said horse put through a meat grinder. Do I feel called to preserve classical hymnody and organ music? No. I believe these things have genuine merit as pieces of art and devotional piety. The organ music of J. S. Bach in particular doesn't need me to preserve it. In fact, my shoddy playing probably does more harm than good to that hallowed oeuvre. I don't preserve organ music. I don't put it in a jar and screw the lid on tight. On the contrary, as a classically trained musician I take it out, bring it into the light, and share it with others. I draw deeply on the well of tradition, the heritage of my craft, and the lineage of my pedagogy (which, why yes, does go back to Bach himself) to create something real for a congregation that engages with this sound in different ways. Some hear the logic in the notes. Some hear and marvel at the engineering and artistry in the instrument I play. Some hear a sound that signals that they're in a church (a kind of sonic incense, if you will). Some hear a music that is completely different than anything else they've heard that week, and they remember that they are in a holy space about to engage in holy things. But none of this is "preserved". I couldn't play the notes the same way twice if I wanted to. And even if I could, subtle variation in humidity and barometric pressure would create tiny variations in the way the pipes of the organ decide to speak that day. And surely no one hears the piece the same way twice -- not the same way after the death of a parent than as after the birth of a child. None of this is pre-served. All of this is fully incarnational. It's served. And if I've done my job right, it's served piping hot, right out of the oven. "1. If you want to nurture a diverse congregation, you need to offer diversity in music. Music plucks the strings of our hearts. If we don't hear ever music that touches us deeply, why bother with this church?" I don't know any musicians who don't enjoy diversity. No one wants to hear a service led exclusively by handbells, or sung only by women with red hair. The organ, on the other hand, has an "internal consistency" of diversity. No other single instrument is capable of these lowest lows and these highest highs. Even your most basic church organ descends lower than the left end of the piano keyboard, and most organs extend far above it's right end too. The glory of church music, now that in [the twentieth] century the whole treasury has been made available to all, is its diversity. A single service can contain the "Old Hundredth," "Ye Holy Angels Bright," and "For All the Saints," and bring, by way of utterly familiar texts and music, six cultures into one act of worship (the Genevan, the Scottish and English, the puritan, the Handelian eighteenth century, the Victorian, and the early twentieth century). A church blessed with such diversity of heritage should welcome a diversity of people. Routley, Erik. Church Music and the Christian Faith. Carol Stream, Ill.: Agape, 1978. 136. Emphasis mine. Furthermore, the idea that music must constantly tug at our heartstrings is not the aim of worship. We worship because God's very being draws praise from our lips. Surely some of that music will move us, but that's a byproduct of what we do. As Lutheran theologian Marva Dawn puts it, we must not rely on church music to be merely a "device" that produces a "commodity" of good feelings. We are used to music doing this in the secular world, but the aims of worship are different, and clergy and musicians together must teach this distinction. "2. Diversity in music needs to be wide-ranging. It isn't as simple as pipe organs vs. guitars. It's black Gospel music, Hispanic music, contemporary Christian music, 'country Baptist' chestnuts, Taize chants, Celtic songs, African call-and-response, as well as the European music that shaped Protestant worship in the postwar era." The pursuit of diversity for its own sake is akin to any other kind of idolatry. And incessant diversity throws our congregations into unfamiliar waters that are too far from shore. Churches need to maintain a connection to Christian tradition for practical reasons: they have to have a shared repertory in order to function. Otherwise no one knows the song, and liturgical music-making becomes exclusively the domain of the expert sight-reader. I'm not saying don't introduce new things -- by all means, do it! But be sensitive to what works and what doesn't in your particular situation. Be aware of what has theological substance, and what's just a gussied up Jesus-love-song. By the way, this is what you pay us for. Not to throw the baby out with the bathwater. 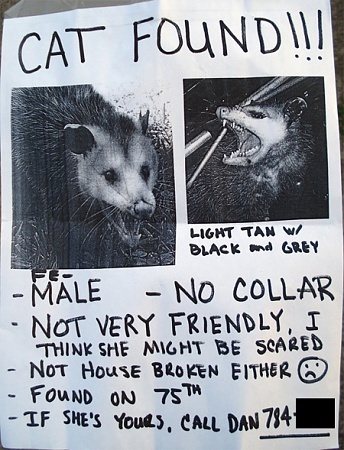 And not to pass a possum off as a cat. "3. The music minister, then, needs to be more than an expert in European hymns and organ playing. He or she needs to be an impresario who brings in diverse music leaders, a teacher of unfamiliar music, an enthusiastic presence, affable, as comfortable with a praise song as with an anthem of civil rights." The image of an impresario is an intriguing one, but Ehrich's expectation that every organist is also an affable cult-leader (he has the same expectation for clergy, by the way) is completely off-base. Has he actually met any organists? If I may speak for my species, we are a pale, nerdy people. Public speaking is hard, as is finding socks that match. And the jack of all trades is an expert in none. The examples here are odd choices. The praise song has largely run its course, even the evangelicals are realizing this (in their own way), and civil rights anthems are speaking mostly to a rapidly graying segment of the pews. "4. The music minister must leave the organ bench and stand in front of the congregation to lead singing. This will be profoundly uncomfortable for some church musicians, but I think it must happen in spite of their discomfort." With not a little snark, I will fight fire with fire here and offer my own No. 4. "4. The priest must leave the prayer desk and sit on the organ bench to lead the hymn. This will be profoundly uncomfortable for clergy (more so for the congregation), but I think it must happen in spite of their discomfort." Let me say that I do get in front of the congregation from time to time to teach music. I think I know what Mr. Ehrich means here, but I think it's unwise to give these kinds of dictums to musicians who have a myriad of strengths. This would be very foreign (and completely unnecessary) in many hearty-singing congregations. "5. Longtime members who resent musical diversity need to get over it. If they want their congregation to have a vibrant future, they need to loosen their grip on music and allow all voices to sing." This is a persistent theme of Ehrich's -- that the old guard need to let said guard down. The problem, of course, is that it jettisons the gifts that our older parishioners have. Rather than making the elderly parishioners pine for the days when their favorite hymns were sung, what if we actually asked them what their favorite hymns are, and record their stories, shared them widely, and together rediscovered a gift from the heritage of our faith. "6. Clergy must become cheerleaders for diversity in music. Not as a champion against the musical establishment, but as an ally who celebrates musicians' willingness to broaden their range." I suspect that if clergy had to broaden their ranges as much as Ehrich has in mind for the musicians we would have Pentecostals leading solemn processions and high church Anglicans handling snakes. Our denominational identity has evolved for particular reasons and in particular ways. Just because we can be said to be living in a post-denominational era does not mean that each parish must be a microcosm of that wider reality. I had the very good fortune to take part in the Royal School of Church Music Carolina Course in Raleigh, North Carolina earlier this month. Our course culminated in a Eucharist at St. Michael's Episcopal Church, Raleigh. I will remember for a long time Father Greg Jones, the rector of the parish, who at the time of the announcements stood, gestured to the choir, and said, "as Episcopalians, this is how we roll." It was an affirming moment for the choir. The girls and adults, and the many hours of work we had put in that week, were valued. The congregation too was affirmed. This is what we do. This is our gift. This is our calling. To sing with "spirit and understanding" in this particular way -- no one else can do it for us. Furthermore, the church has an enormous wealth of diverse music, and new music is being written all the time. It is a rare musician indeed who does not already keep abreast of the latest threads in the musical universe. If clergy truly want to be cheerleaders for musical diversity, they, in consultation with their musician, could commission new pieces of music from a composer whose music they enjoy, or from a composer who has not yet written for the church. For hundreds of years the church has fostered some of the greatest art in the Western world. We should not abandon this legacy. I want to go back now, at the end of this already lengthy screed, to point out one key line that I omitted: The most common source of leadership conflict in a church is a battle over music, often a duel between an entrenched music minister and a new pastor. This, says Ehrich, is "the musical conundrum". Who is Ehrich preaching to here? I'm guessing it's not the choir. And his points are his suggested ways to win this duel. He suggests we are entrenched. ". . . a battle over music . . ."
This, my dear reader, in very plain language, is an Episcopal priest perpetuating the "worship wars" on the front lines. When will Tom Ehrich come down off his soapbox and actually talk to church musicians rather than fanning the flames of already unsettled clergy -- clergy working in a time of decline in the church, clergy who generally have a very poor grounding in music. Why must he pit them against their musicians? Would Ehrich consider that we church musicians are not a "conundrum", but rather fellow Christians who are on the same journey he is? The [church musician] is to exorcize as far as possible divisive attitudes and thoughts, and to celebrate that which is really the common music of as many kinds of people as possible. This is not pop or trendy music; it is not ephemeral, posturing music. It is precisely the "Old Hundredth," "Ye Holy Angels Bright[,]" and "For All the Saints"--nobody need claim to be too cultured to respect those, and nobody does claim to be too uneducated to enjoy them. In choral and organ music, the trained musician knows where to find authenticity whether it is English Anglican, German baroque, verse-anthem, Howells, Britten, or the fine clear stream that is flowing through modern American music. The musician must not yield to pressure and set aside his knowledge and the conscience and discernment he or she has developed. Blessed, remember, are not the peace lovers, but the peacemakers. I'm raising the white flag. I hope Tom Ehrich will too. One wonders if the Rev. Ehrich could preach the sermon which could be the handmaid of the music he espouses. Who would come to listen to the first, the second? I say this, having heard several of his sermons in person. While interesting, they all were from the same album. How about some diversity in preaching? Prove your stuff Fr. Erich, we're ready for the bluegrass sermon. I commented on Fr. Erich's Epistle to the Music Minister elsewhere ... He's very tiresome. My rather vibrant parish and its Music Ministry are centered on classical music, with particular music from other genre when those particular texts and tunes fit the liturgical context in parish life. And the most recent requests for anything were echoed by our contemporary music loving pastor at yesterday's staff meeting when he said, "the 30 somethings have been asking for more Gregorian chant."